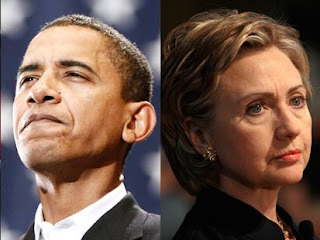 The Ostroy Report: Is Hillary Planning a Run at Obama in 2012? Is Hillary Planning a Run at Obama in 2012? Secretary of State Hillary Clinton and President Barack Obama. I think their pairing was borne out of mutual need: For Obama, it was clearly all about, "keep your friends close and your enemies closer." And for Hillary, taking the top diplomatic job would serve to repair her election-loss image and quickly make her appear presidential again. It was and is a marriage of convenience, and one that is likely full of residual contention and resentment from 2008. Fueling speculation is the fact that last week Clinton abruptly announced that she would not serve in a second Obama administration. Is that because she intends to pursue a Clinton administration in 2012? Her announcement comes amid the violence and political turmoil in Libya in which the United States, Britain and France have begun a massive air strike, following the passage of a United Nations resolution authorizing a no-fly zone and the use of military force designed to end Col. Muammar Gaddafi's brutal repression of opposition protesters. It was Clinton, not Obama, who's been front and center through this crisis, swiftly threatening Gaddafi with military action if he didn't stop the killing. To the contrary, the president's been criticized for not taking a strong enough stand against the Libyan dictator. To be sure, it was Hillary, not Obama, who had the bigger cajones. And that's no great surprise to this blogger, who wrote many pieces during the 2008 campaign that questioned Obama's inability to fight the tough fight, unlike his former rival. It's no secret that Obama, the much heralded 'Agent of Change', has hugely disappointed those who euphorically supported him and whose mantra is now "change we can't believe in." Progressives and mainstream Democrats alike seethe over his move to the center and for failing to deliver on the issues on which he campaigned and were important to them, from the public option to repealing the Bush tax cuts for the wealthy, and for caving to Republicans. economy and job growth still stuck in a painfully slow recovery, do these domestic challenges, especially when combined with questions over his handling of world crises, create fertile ground for Clinton to toss her pantsuit into the ring? It's rare for a prominent member of a sitting president's party to challenge him in the primaries for the nomination. In fact, the last time it was done was 1968 when Minnesota Sen. Eugene McCarthy took on a weakened, unpopular Lyndon B. Johnson. But the Clintons are not your typical deferential, passive politicians. If anyone could trade protocol for self-interest it's the uber-ambitious Hillary and her rock star hubby Bill. Both would like nothing more than to be back in the White House. And if for a second they smell Obama's vulnerability and a potential defeat by the GOP, don't be surprised if she pulls a McCarthy. It's a longshot, but these days in politics anything can and will happen. I can tell you one thing though: I've spoken to many Democrats who'd drop Obama and vote for Hillary in a heartbeat. You're forgetting Ted Kennedy, in 1980. Hardly a recipe for success, and pragmatist that Hillary is, hard to imagine her doing it. That being said, I'll vote for just about anyone challenging Obama in the primaries (and in the general election, if he is the nominee, I'll probably vote third party or not vote at all, for the first time in my life). I've had reason to reassess my fealty to Bill Clinton these past years, especially since he's among those responsible for handing the keys to our economy over to Goldman Sachs, et al. Honestly, I don't know that Hillary's any different— would the toxic influence of Bob Rubin animate her policy?—but I'd be willing to find out. "It's rare for a prominent member of a sitting president's party to challenge him in the primaries for the nomination. In fact, the last time it was done was 1968 when Minnesota Sen. Eugene McCarthy took on a weakened, unpopular Lyndon B. Johnson." I guess you missed the 1980 primaries when Edward "The Swimmer" Kennedy challenged Jimmy Carter. And I'm not surprised that you know plenty of Dems who would drop Obama in a minute for Hillary. Democrats need blacks in elections for their votes, not to be candidates. Silly people think you guys actually care about them for anything other than their votes.